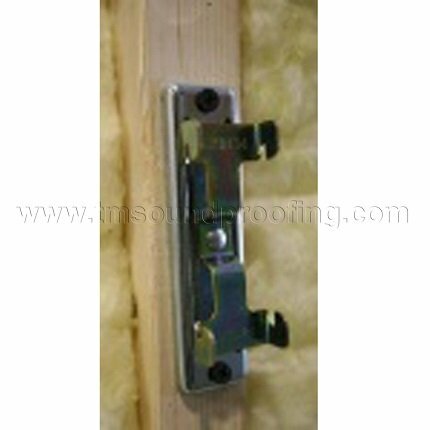 The Whisper Clip is the Highest Rated and Easiest to Install Clip for Decoupling Walls and Ceilings. Used in the process of decoupling walls, ceilings or floors, to prevent sound vibrations from traveling from one side of the structure to the other. 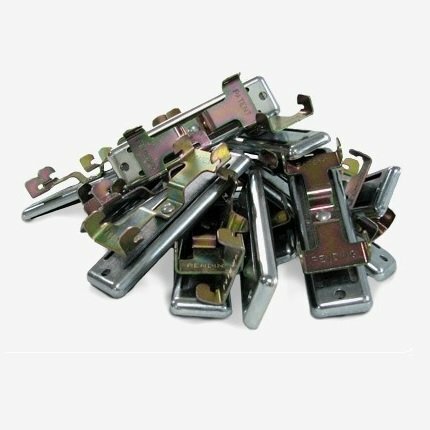 Clips can be ordered per piece or in bulk packaging of 10 clips with installation screws included. Special Quantity Discounts start at 20 clips. Discounts automatically applied when added to cart. 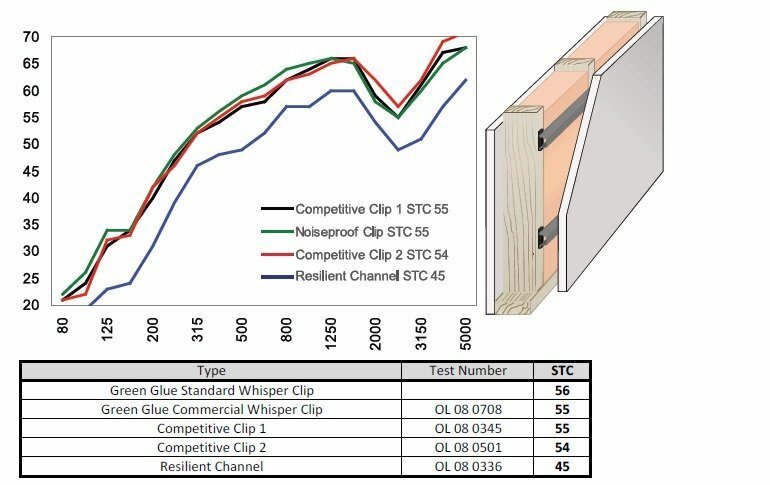 The Whisper Clip which is also known as the Green Glue Noiseproofing Clip was designed to be the highest performance sound isolation clip on the market, while remaining cost competitive. 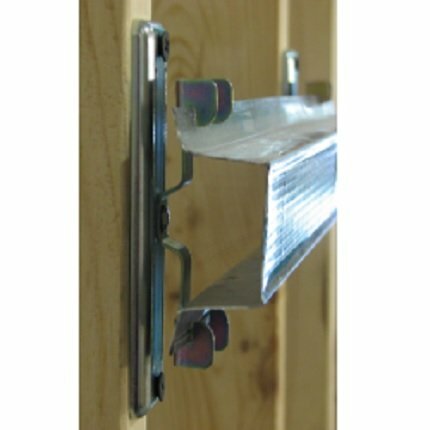 Whisper Clips and channels are used in the process of decoupling walls and/or ceilings from the joists, creating what is called a floating wall or ceiling. Decoupling the wall or ceiling helps prevent vibrations from traveling from one side of the structure to the other. This break in the path greatly reduces the amount of noise that travels from one side to the other in two ways. 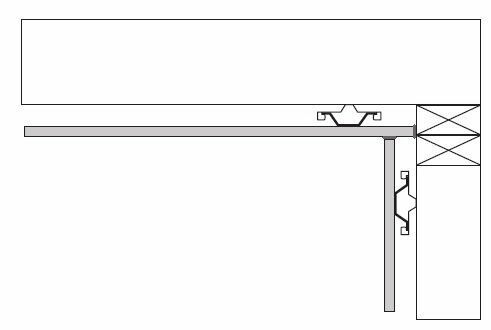 Firstly, there is no direct connection for sound to travel via the joists as the wall/ceiling is disconnected. Secondly, the wall and ceiling are given resiliency (flexibility), thus greatly reducing vibration (similar to shock springs on a car). Whisper Clips are the highest performing resilient sound clips available on the market. Its patented design delivers decoupling and resilience that is unmatched by any other product. 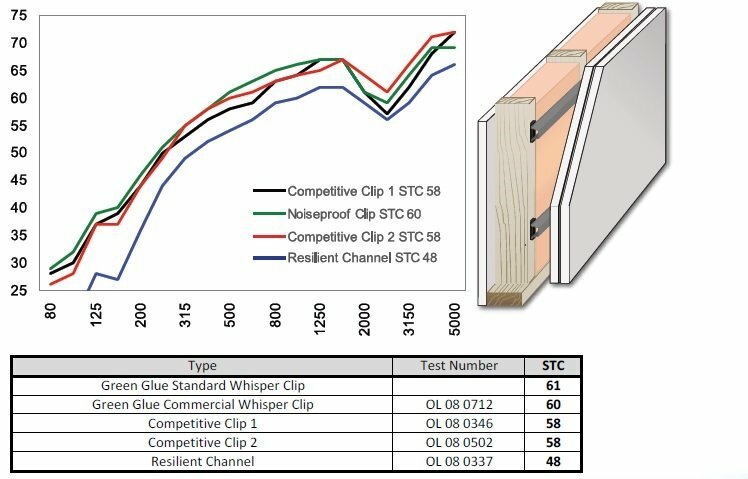 By decoupling the drywall from the ceiling and/or wall, Whisper Clips can achieve an astounding STC of 56 with just one layer of drywall. See Technical Data Sheet for more information. Whisper Clips were designed with maximum low frequency sound isolation in mind, so walls fortified with whisper clips will eliminate the bass sounds most commonly found with home entertainment and theater systems. Whisper clips cannot be short circuited, unlike resilient clips, ensuring maximum sound absorption at all times. 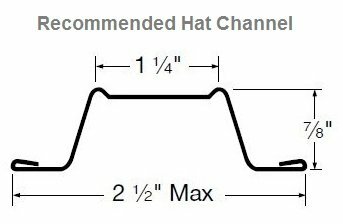 Whisper clips does not require special drywall; regular off the shelf product and readily available hat channel are all you need. Whisper Clips work better and last longer. 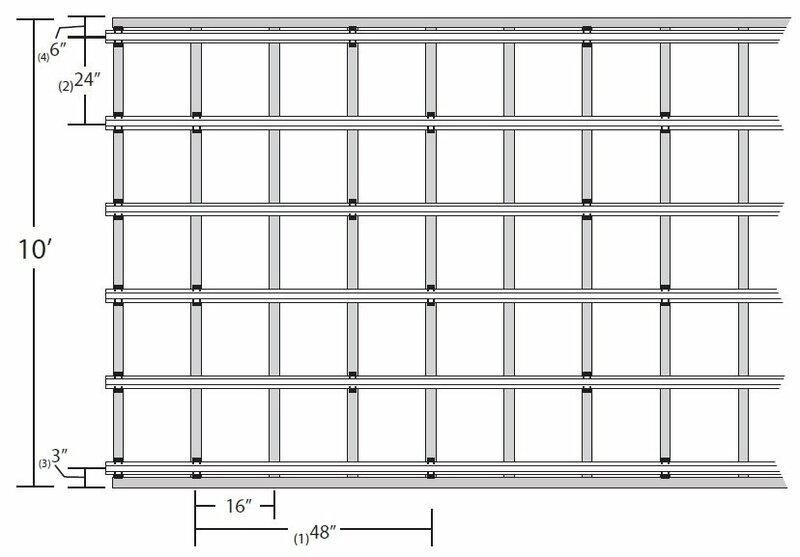 No need for double stud or staggered stud,wall assemblies. Installation is simple and affordable. An additional benefit of the Standard Whisper Clips is that you can apply the hat channel to the clips before screwing the clips into the studs. See Installation Guide or video tutorial to the right for more information. You can space the clips at 48" apart and up to 24" between the channels. As a general rule, figure one Whisper Clip for every 5 square feet (20% of total square footage). However, since more clips are required for the ends of the walls / ceiling, we recommending purchasing at least 23% of total square footage (multiply the total square footage by .23). See Installation Tab to the right for a layout diagram. Clips can be ordered per piece or in discounted packs of 10. When buying per pack, screws are included for installation. 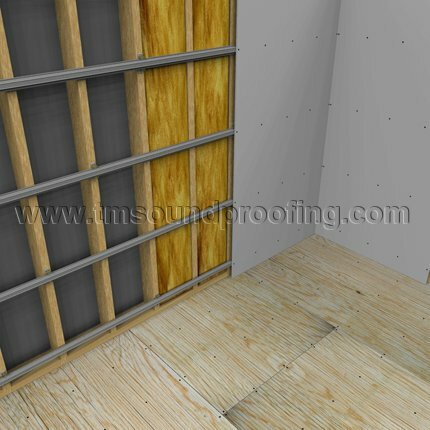 For detailed usage see our How to Soundproof Article. 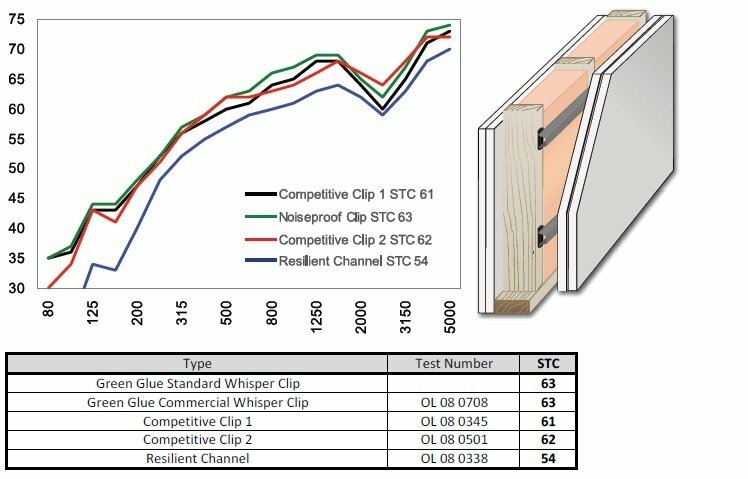 For large-scale soundproofing projects, consider our Commercial Whisper Clips. 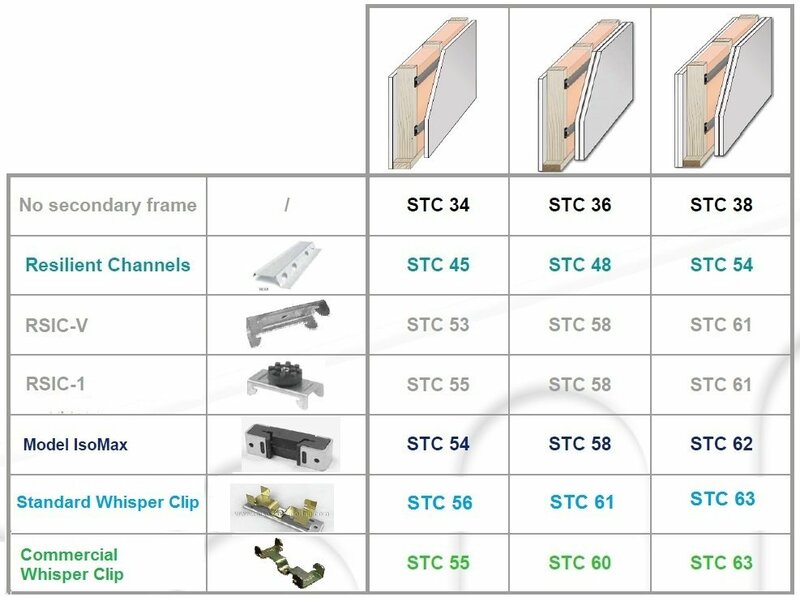 Commercial Clips have a slightly lower STC rating with significantly lower costs. 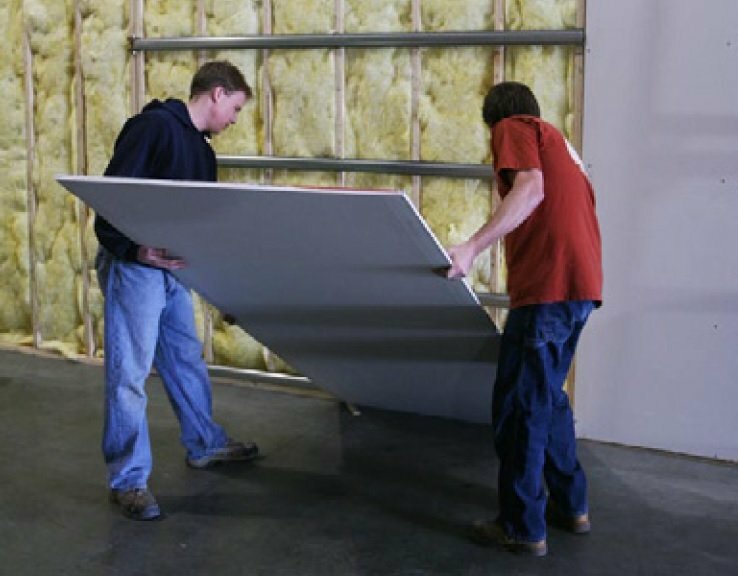 Need help planning your soundproofing project? You can always call our office at 845-388-1300 with any installation questions that arise. Feel confident when placing your order with Trademark Soundproofing, as we are always here to assist you with installation advice and tips. Free Shipping applies to orders over $75.00 and above. See our Shipping / Return Tab to the right. Whisper Clips have a higher STC Rating than competitive clips. exceptionally well at low frequencies. 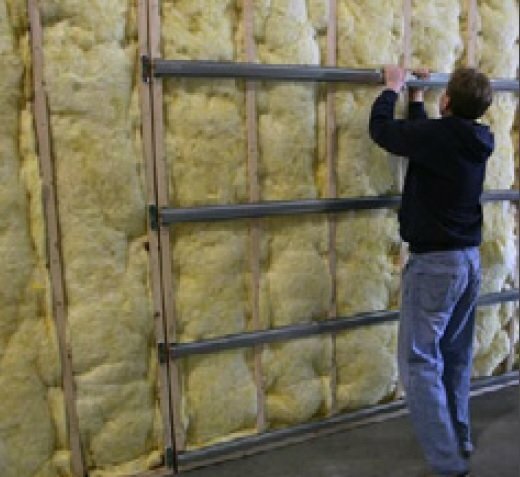 Adding mass to a wall by installing a second layer is always beneficial. transmission loss of the structure more than our competition clips. Again, the Whisper Clip continues to excel at lower frequencies. Green Glue Noiseproofing Compound to improve transmission loss. 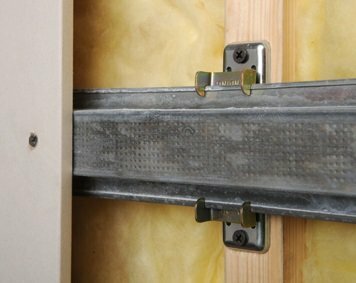 To distribute the weight of the drywall evenly, we recommend that you stagger the Clips on the studs or joists. Measure for placement of Whisper Clips using layout guidelines listed above. Mark locations and install clips using appropriate screws, see below. 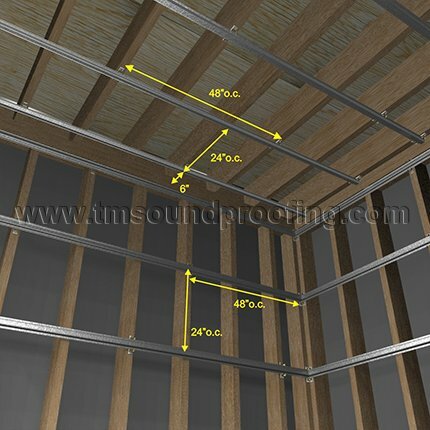 Note, Install ceiling drywall before walls to allow for a fire stop by butting ceiling drywall to studs, See diagram to the bottom left. Cut the hat channel to length using a pair of metal cutting shears. Once cut, fasten the hat channel into the Noiseproofing Clip by inserting the bottom lip first and pulling down to snap the channel into place. Overlap 6” of hat channel between two clips. 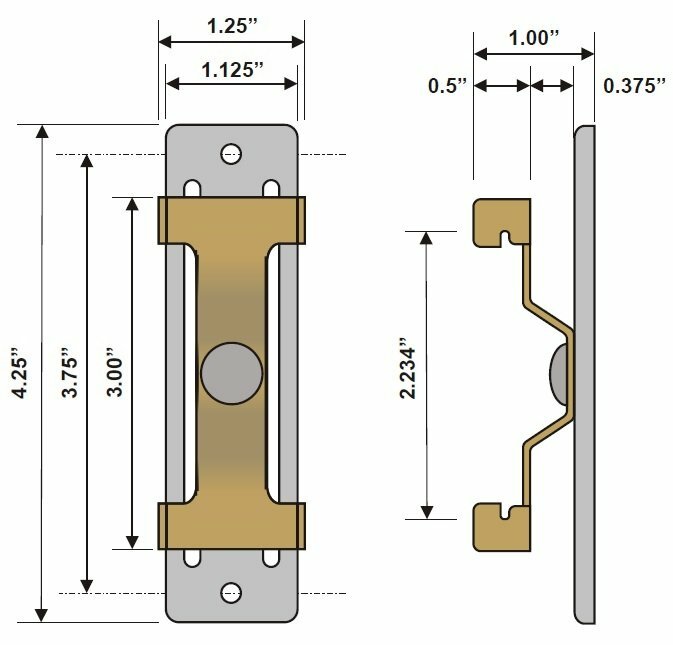 Secure the hat channel with two 7/16” framing screws. 18 gauge tie-wire can also be used. Compatible Hat Channel can be purchased by selecting link. Place 1/4" shims on the floor to allow spacing between the drywall and the flooring. This ensures decoupling from the floor to make it impossible for vibrations to travel from wall to floor and vice-verse. Screw drywall in place through hat channel. 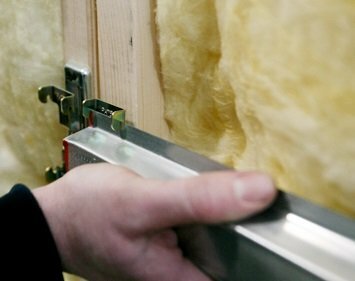 While hanging your first layer of drywall, space screws on the channel according to your local building code. Recommended Screws: For the first layer of drywall, use 1-1/4" fine thread drywall screws with any additional layers being fastened with 1-5/8” coarse thread drywall screws. 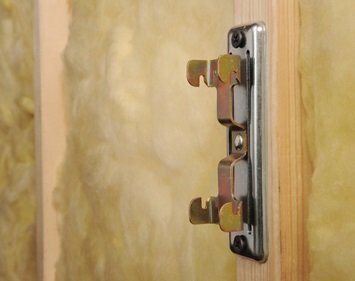 Be sure not to use longer screws as they could penetrate the stud and couple the drywall to the frame, thereby creating a short circuit and reducing the benefits of the Clips. Be sure drywall is fully installed before removing shims from underneath. 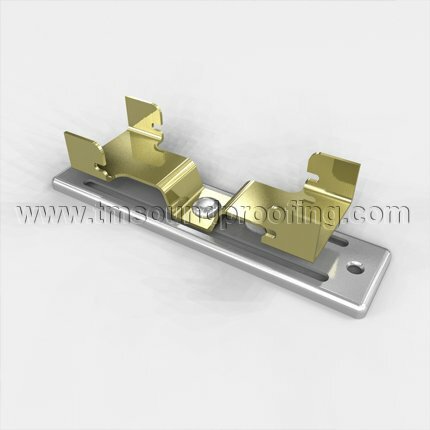 Clips are designed to carry hat channels with one or more layers of wallboard attached. To load capacity depends on the spacing and number of clips used. 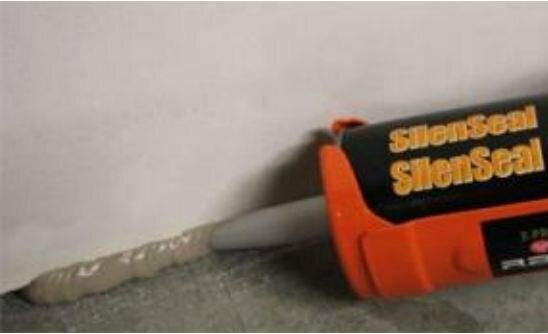 Be sure to use an acoustical sealant to fill gaps around electrical boxes, windows, doors, and areas below and above sheets of drywall. Green Glue’s Acoustical Caulk is perfect for this application as it allows flexibility, while stopping sound from transmitting through unsealed areas. Note, if applying a base board to the drywall, ensure that the base board is attached to the drywall only, and does not connect the wall to the floor, as this will create a short circuit thereby reducing the benefit of the clips. Shipping and Return information is specific to this product page only (not for other products on our site). Material is in stock and ships within 24 hours from our East or West coast facility. FREE SHIPPING for orders over $75.00 in the USA (excluding Alaska and Hawaii). A flat fee of $14.99 will be applied to orders under $75.00. Ships FedEx Ground, reaching most of the USA within 1-3 business day's. Overnight and Express shipping is available. Please call us at 845-388-1200. Shipping time varies. For more information see our Shipping Information page. Product can be returned up to 60 days, if in brand new condition. A $10.00 fee will be deducted to cover our original shipping cost. Return shipping is customer's responsibility. Product installation is simple,gives you a straight flat wall especially if you are tiling the wall.The sound was cut in half from outside noise,and the bathroom is almost completely sound proofed.If I didn't still have the two thirty year old windows you probably will not here anything.I used the Whisper clips in conjuction with Quite rock drywall,with green glue,and another sheet of 3/4 " fire rated,drywall.This application was used in my Masterbeedroom,with a full bath.Excellent product. Thank you. As an owner of a townhouse with no construction experience, I was able to do this and so can you! The problem with the townhouse was that the party walls were made up of only 1 layer of 5/8" drywall and double stud setup which allowed me to hear my neighbor next door snoring and sneezing. So I decided to experiment on the party walls to see which works and which doesn't. At first, I tried just slapping an extra layer of 5/8" drywall dampened with GreenGlue without doing the decoupling clips in my small bedroom because I didn't want to lose space. The result was that the previous noise such as the snoring all just got muffled. The vibrating noise like the bass and knocking can still come through like before. Then for the dining room, I use the decoupling technique with GenieClips and 2 layers of GreenGlue dampened 5/8" drywall. This knocked out a major portion of noise and bass from the loud TV in the living room next door.There are still some indistinguishable noise that comes through from flanking mostly some of the bass is still a problem but not like before where I can clearing make out what was playing on TV. Lastly, the living room was decoupled using Whisperclips and 2 layers of GreenGlue dampened 5/8" drywall. The result was similar to that of the GenieClip. I would say that both Genieclip and Whisperclip does a similar enough job. The only difference is that the Whisperclip is slimmer by a tiny, tiny amount like a couple of MM. This amount of space difference is nothing considering that you have to give up about 2 inches of wall space when you go with decoupling. Another difference was that the GenieClip contained more plastic/rubber than in the Whisperclip. It looks like some sort of polyurethane rubber that will last a lifetime but I'm sure it won't last forever. The Whisperclip uses a thin slip of foam to rest in the stud but the decoupling is done by two strands of springy metal strips. My advise is to go with whichever is cheaper but Whisperclip has a tiny slight advantage for me. 1) Finley S: Hi, I'm in the process of designing a floating room to build in my apartment I can practice music in. 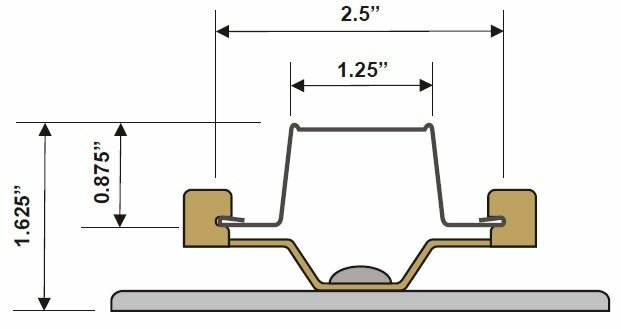 Are the whisper clips something that I can use with metal studs? I was going to use metal wall studs for the walls, ceiling, and hopefully floor, because it's lighter and easier to work with. Thanks for your help. 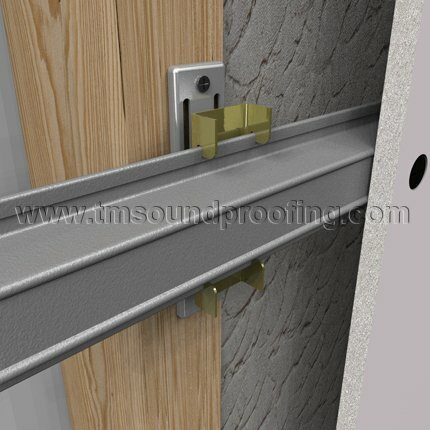 Trademark Soundproofing Reply: Yes the Whisper Clip can be used on Metal Studs too, just use appropriate screws. 2) kim: how many piece that i need for 740 sf ceiling ? Hi Kim, Approx 170 clips. Yes. Adding a damped drywall to your decoupled wall is a good idea (you can also create your own by using 2 layers of drywall with Green Glue in between. An added benefit would be the extra weight on the clips which is good for sound control).. Just run acoustical caulk where the drywall meets and then spackle and tape. You should not get much sound transfer through there. Trademark Soundproofing Reply: If your joists are 16 OC than every 3rd joist (48 inches). That is a maximum if you need to apply clips at smaller spacing that is fine. 5) Fernando: Our house is across the street from a bus station and I want to block as much as possible the noise from the diesel engines (very low frequency noise). What will give me the best bang for my buck, the whisper clips or double drywall with green glue? Also, is there any type of siding that you would recommend on the exterior side of the wall? Trademark Soundproofing Reply: Whisper clips and channel will give you a higher rating than double drywall with GG. We don't have any info on special sound resistant siding. However putting up a 2nd layer of plywood with GG in between over the existing sheathing would be great. Trademark Soundproofing Reply: If you use a double layer of drywall with the Green Glue on the clips and channels you will not have the low resonance issue. Trademark Soundproofing Reply: Orders placed by 1pm ET usually ship the same day. If your order is over $75.00 it will ship free with FedEx ground. If you would like to pay for overnight shipping give us a call and we can quote that for you. 8) Mike: I haven?t wired studio & need to do that first. How far out do I need to set outlets for offset that whisper clips produce ? Trademark Soundproofing Reply: An inch and 5/8 for the residential and an inch and a half for the commercial clips. 9) d kirkwood: I have a 20x20 garage w/ 2x4 walls and 2x6 ceiling joists. Walls and ceiling are insulated with fiberglass batt R-19. I want to soundproof the space so I can play trumpet and electric guitar without bothering neighbors. 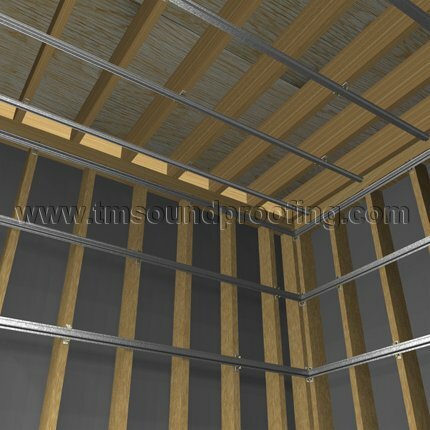 Is there a significant difference in sound proof result using the whisper clips attached to existing studs/Joists, with double layer of 5/8" sheet rock/green glue, OR, a system using whisper clips/channel on ceiling, and building 2x6 walls inside the garage--walls to be insulated with R19, and both wall/ceiling getting 2 layers of sheet rock with green glue? Trademark Soundproofing Reply: A true double wall is better than a wall with Clips. However the difference may not be large enough to warrant the extra space, cost and labor, if that is of concern. Your assembly with the clips is very good and should be enough.